From Blue Dragon and its two DS installments to Japan-only title ASH: Archaic Sealed Heat to Lost Odyssey to the more cartooned Away: Shuffle Dungeon, then to The Last Story, Mistwalker has built up a delightfully masterful listing of artistically inclined RPG accomplishments, and has made their way into my top three personal favorite development teams since Final Fantasy creator and legend, Hironobu Sakaguchi took his leave from Square Enix. However, their latest work of art, and also their first iOS game completely defies their novel-esque, long-form fantasy signature. For $1.99, Party Wave, structured in stages, is themed around drawing surfers together whilst avoiding obstacles and keeping them riding or in the air once they catch a wave. 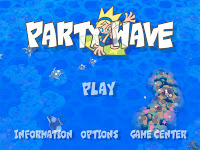 While the majority of their past games have provided strictly to players who are serious about investing time into playing games, Party Wave caters much more to the casual gamer who has a few minutes to kill by attempting best their previous score. Though this theme brings a drastic shift to the Mistwalker lineup, it makes sense considering that Sakaguchi lives Honolulu, Hawaii and is very passionate about surfing. Each stage has two parts. 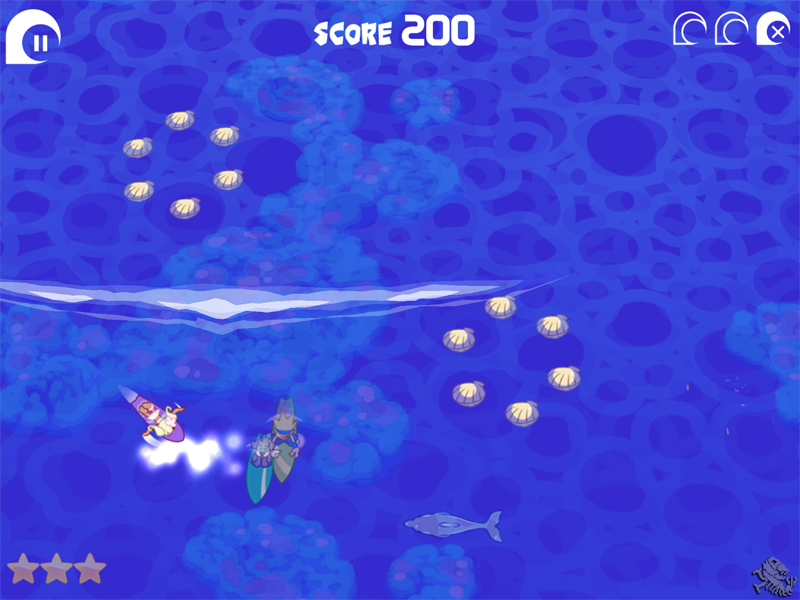 In the first part, from a top-down perspective, the player must guide surfers to a designated spot before the wave forms by drawing lines on the screen. In doing so, they must lead the surfers around obstructions such as coral reefs, sea turtles, dolphins and circles of oysters. Once the wave forms, any surfers that were successfully guided to the point in front of the wave are engaged in the second part of the stage. 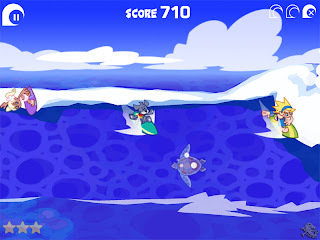 In this half, the player must constantly tap the surfers to keep them riding above the wave, earning points for their stage score. 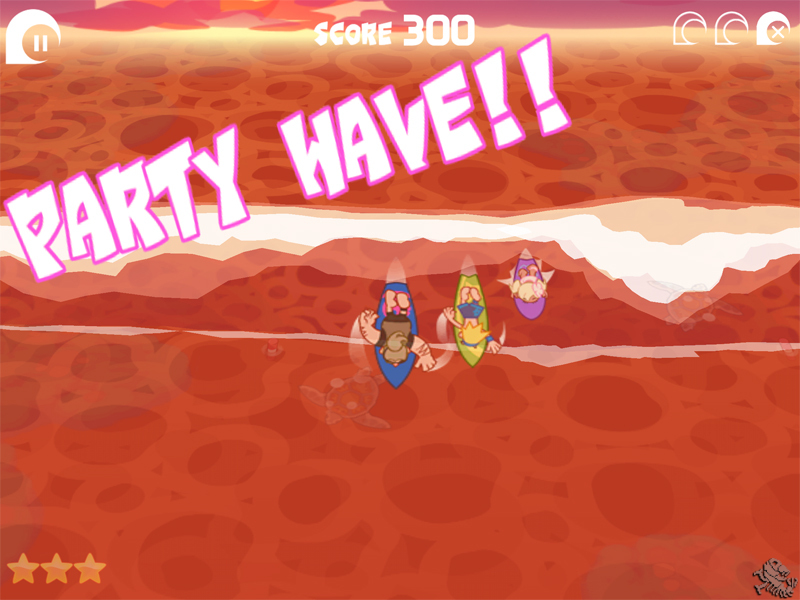 While keeping the surfers from wiping out, the player must avoid tapping on dangers like sea turtles and jelly fish. Throughout this part, star pickups will appear that negate these dangers if obtained. Additionally, an alien in a UFO will occasionally appear who will give you a star if you rub him onscreen. The game get considerably chaotic as the stages progress! 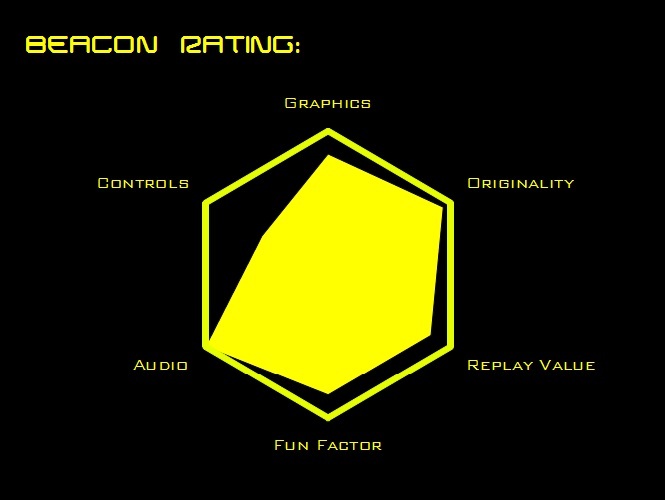 There is no debate that the game's controls are a little unclear. In the first part of each stage, the player is drawing lines, whereas in the second part the player only needs to tap for the most part. I feel that the game could do a much better job in communicating that you don't need to 'drag' the surfers to the top of the wave, and instead just touch them. The surfers can also be tapped while in the air to be boosted higher into the air, which again is something that the game could do a better job conveying to the player. In the first part of the stage, when drawing the surfers together, it seems that the characters do a better job swimming toward the goal point on their own than they do following the player's lines. I would have to say all together that the controls are definitely a weak point for Party Wave, though this weakness doesn't entirely kill the fun factor, for me at least. They could definitely use improvement. 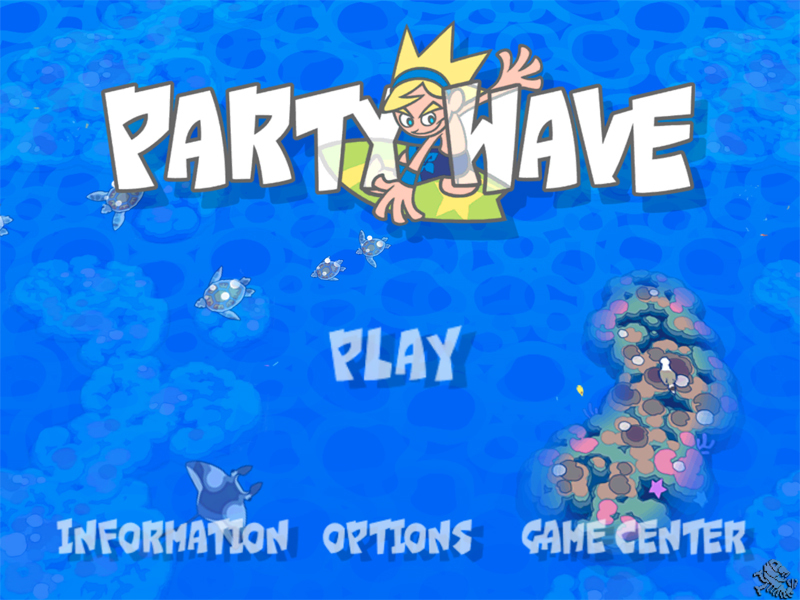 I do appreciate the artstyle and graphics in Party Wave. 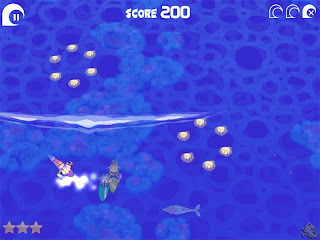 Especially the fluidity of some of the animations, most notably the water, wave, characters and backdrop. I am also very much a fan of how well the sky and background layers change throughout different times of day, altering the entire color scheme of the environment. If you have an appreciation for 2D cartooning and stylistic sprite animation, I'm confident that you'd find Party Wave's graphics fairly impressive. The visuals that create the main menu I found to seem somewhat dull or stale in structure, style and layout, however. I feel that It could have been designed to be much more unique while still maintaining its level of simplicity. While on the topic of the main menu, it contains the most notable track of the game's music in my opinion. All of the music is well composed in general, but I remember the main menu theme from the original trailer. For me, the game's audio is definitely a strong point for Party Wave. The SFX all flow together well throughout the stages, especially during the transition from the first part of each stage into riding the wave, When the words “Party Wave” are celebrated with text and voice. The character voices are also memorable and well thought out. Party Wave, like most every game, certainly has its flaws. But I feel those flaws are returned with plenty of strong quality in other areas. 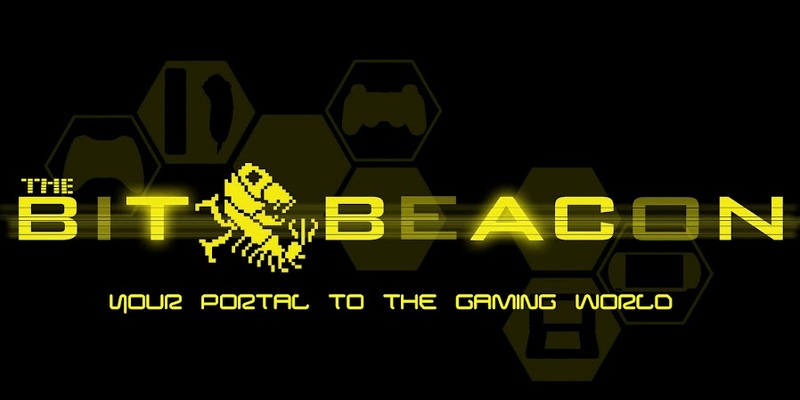 Overall, while bailing in the department of controls, and having plenty of room for improvement in its interface, the game design constructs a concept this is fun and I often catch myself shouting “Party Wave” out loud along with the game while playing. Its award system per stage, granting 'Perfect' marks once completing the stage without error is also capable of creating player addiction.